Today is officially the first day of spring and it is one of my favourite days of the year as it is also St Brigid’s Day. This iconic woman is one of the most amazing role models in Irish history and yet I’m amazed to hear each year how many people have forgotten her story. 'Iconic' and 'role model' are phrases oft bandied about and as a result, have lost some of their power and meaning but both are true of this fascinating woman. With that in mind, here are a few things to have to hand when spreading the word about this unsung Irish hero. 1. Who is St Brigid? Born in Dundalk in 450 AD St Brigid was the founder of the first monastery in County Kildare, Ireland. Her father was a pagan chieftain of Leinster and her mother was a Christian. St Patrick inspired her to deepen her father and spread the word of God. St Brigid is also known as Mary of the Gael or Muire na nGael aka Our Lady of the Irish. She is one of the Patron Saints of Ireland, along with St Patrick and St Columcille. When she was young, St Brigid wanted to join a convent however her father took a firm stand and insisted that she marry the wealthy man he had promised her to. The story goes that she asked for God’s help to take away her beauty so that the man wouldn’t want to marry her. Her wish was granted, her father caved and she joined the convent. Not only did her beauty return but apparently she was even more beautiful than ever. She called on God’s help again to convince her father to give her land in Kildare to set up a convent. Her father said that he would only give her as much land as her cloak could cover. Silly man. With God’s help, the cloak grew to cover acres of land. St Brigid was by the sick bed of a dying pagan chieftain, possibly her father, soothing him with stories about her faith and her unwavering trust in God. She began telling the story of Christ on the Cross, picking up rushes from the ground to make a cross. Before his death, the chieftain asked to be baptised. Initially, legend has it, people used to make similar crosses to hang over the door of their homes to ward off evil, fire and hunger. 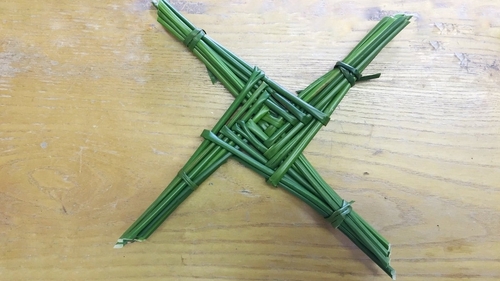 Over time, word spread about St Brigid, her kindness, faith and the making of the cross became synonymous with her and the tradition now bears her name. 5. Where is she buried? St Brigid died at the age of 75 in AD 525 and was buried in the church she created. Her remains were exhumed years later and brought to Downpatrick to be buried alongside Saints Patrick and Columcille. However, her skull was brought to Lisbon where it remains today.